Adams Industries designed and manufactures a superior mount that provides a robust solution to this problem. The Adams Industries Rugged ANVIS Mount (RAM) incorporates a stronger material, improved cable management and a more streamlined profile to ensure the mount will provide a rugged secure base for the ANVIS night vision goggle (NVG) with less snag and drag and provides the proper ANVIS mounting interface for flight helmets. The standard helmet mount issued by Army Aviation supplies has several weaknesses that result in breakage and lack of service. Feedback from the ALSE community and the service and repair depots from both the military and commercial aviation have identified specific issues which require service repair or replacement. The front goggle receiver port on the standard mount is created with thin molded plastic parts and assembled. The side supports that secure the NVG in place and provide upward stowage are weak and will break at approximately 17 lbs force on side impact. In addition, the cable is routed into the mount at several different points on each side of the mount and may create a snag hazard. Moreover, the black wire will frequently pull out of the mount and render the mount and NVG inoperable. The Adams Industries Rugged ANVIS Mount (RAM) was designed to overcome those weaknesses and provide a more rugged and reliable helmet mount. The major support components in the RAM mount are machined from a stronger material instead of using thin injection molded pieces. As a result, the unit will withstand greater than 100 lbs force on side impact, considerably more than most pilots or crew will require and more than five (5x) times the standard mount. In addition, the Adams Industries RAM is designed with better cable management that routes all conductors through a single shielded cable until it enters the main support to eliminate snag hazards and simplify wiring. Moreover, the routing eliminates the issue of any wires pulling out of their contact points. 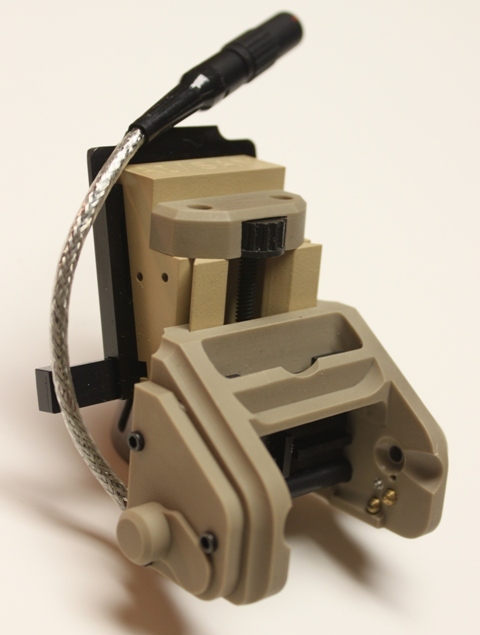 The Adams industries RAM helmet mount provides the unique 4-contact receiver for the ANVIS NVG with the ball-plunger interface which provides power to the devise. The RAM helmet mount provides optimum translation from the operational (down) position to the stowed (up) position while maintaining a low profile on the user's helmet and provides vertical adjustment for NVG alignment to the user's eyes. The RAM mount uses a 4" shielded cable to connect with the low profile battery pack usually located on the back of the helmet and can be routed along the side or top of the outer surface of the helmet.